The Happy99 worm first appeared. 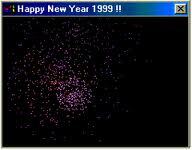 It invisibly attached itself to emails, displayed fireworks to hide the changes being made, and wished the user a happy New Year. It was the first of a wave of malware that struck Microsoft Windows computers over the next several years, costing businesses and individuals untold amounts of money to resolve.